The Cooks: Thought you should know! Got married in May and have been saving every dime. Just the thought of our own home makes us grin. Why wait, we’ll add just one! whoa!! you guys wasted no time ;) that means you, tracy, and lisa will all be having babies around the same time! congrats! WOW! That is so exciting, Congrats. You're making me want one but we have to wait just a little longer!! April babies are the best! Congrats!!! So excited for you guys! 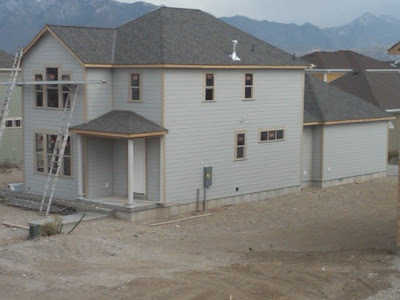 I can't believe how fast your house is coming along and even more excited that our babies will be a month apart- or less if we can figure out a good enough plan! Whoa! Congratulations, guys! That's awesome. So many fun changes coming your way! Kira, I hope you are not sick. Reuben, you're going to be a stellar daddy. We're so happy for you guys! I've been wondering when that announcement would make it to your blog! Clark and I are SO super excited for you guys! Kira I am so happy for you guys!! A baby and a new house- sounds awesome!! I was just visiting Tracy and Joe in San Jose last weekend, and Molly and KC can by one night, wish you were near by to visit too. Oh my gosh!!!!!! Congratulations. It is crazy what you can find out through facebook. Congrats on your house too. It looks amazing. I will have to come try out the kayaks. Love you. Congrats to you both!!!! What was the slogan, Reuben? Put kids in the pen in 2010!!!! So happy for you! You'll be great parents! Awesome...finally a little Cook to kept up the peruvian traditions!